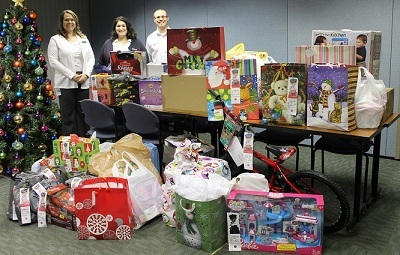 Branch Manager Andrea Sawchuk and Amanda Russo and Tyler Engle, member advocates, helped organize the collected gifts before they were picked up by the Salvation Army. The $387 million Diamond Credit Union hosted a Salvation Army Angel Tree in its Pottstown, Pa., office lobby for the eighth consecutive year. More than 60 underprivileged children in the area will receive the gifts of toys and clothing donated by members and employees.